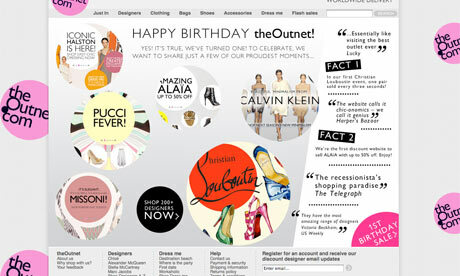 Yesterday marked the first birthday of Net-a-Porter’s little sister, The Outnet. The designer discount site has been immensely popular since it’s launch, mostly due to it’s regular flash sales. I’ll put my hand up to admit that Outnet stalking had turned into one of my favourite pastimes, I know many of you were the same. There was something strangely hypnotic about watching the price of a Marc Jacobs bag tumble before your eyes. To celebrate their first birthday, The Outnet went all out with a £1 designer sale. The sale to end all sales. This was all very heavily marketed and as the big date, April 16th, drew closer, the hype just grew and grew. But as I logged on to Twitter, I knew something was wrong. Everyone was complaining about not being able to log in, the site crashing and not being able to check out. This happened a couple of months ago during their pop-up sale. But seeing as you had to RSVP to have access to the £1 sale, I had assumed that they would have looked at their server capacity in relation to the expected demand. It was very reminiscent of the American Apparel crazy sale madness, see below video. To be honest, these two events have left a very sour taste in my mouth. I feel that companies are far too busy creating hype and noise about their sales to worry about how to manage them logistically, whether that’s extra security in real life or working out server loads online. What do you think of The Outnet madness? Did you manage to get anything? Did you get caught up in the American Apparel riot?! I just got annoyed when they started referring to people who'd managed to purchase something as 'winners'. This wasn't advertised as a competition! If they knew only a small number of the people who had signed up would actually have been able to purchase they should have issued a smaller number of lucky emails so that the rest of us didn't spend hours hanging around with things in our basket and no way to actually put the transaction through… stupid servers.Next time how about they make it an 'everything is £50 sale'. Still a bargain! PR stunts are all well and good, but not when they piss everyone off. I think the negative coverage will far outweigh the good on this one. This wasn't handled well at all, I mean, I didn't take part in this at all but now I'm quite wary about any future exclusive sales like this one.What a shame! You're speaking my language, Reena! Whilst I loved the AA videos, I didn't go as AA's pretty affordable anyway. I was far more excited by the prospect of a £1 designer bargain! But, no, nothing to be had, and of the ten or so friends I forwarded the invite to, nobody got anything. This hasn't encouraged me to sign up; just to think their sales are badly handled and not bother with the next one. And I thought the Twitter feed was graceless in the extreme – in these days of social media feedback/fallout travelling super-quick-fast, you'd think they would have the sense to apologise and not PR, PR, PR….. I stayed up all night/morning waiting for this because I had a sneaking suspicion they would open the sale a) early and b) at a completely random time rather than say 8.00am, 8.30am. When I finally managed to get on the site it was complete and utter chaos. The site logged me off a couple of times and it was taking forever to load pages so you item had sold out by the time you got its description page to open. In a mad scramble I did manage to get this Rachel Roy gown (http://www.theoutnet.com/product/32360) reduced from £615. I didn't realise quite how lucky I was to actually get anything, never mind a dress that was actually in my size, till I saw all the feeds from bloggers and twitter coming through. Ok, so you know I got lucky. But honestly I still feel it was handled badly. It seems like it was grossly mis-advertised, if indeed it was a competition, why make it seem like everyone/anyone would be able to snag a bargain? Idk. Seems like it backfired on them. I can't even express how awful I think it is for any brand to participate in a 1 pound sale….gross….it brings everyone down. I would melt down my work before giving it away like that. I was also very dissapointed. I could get in at first, but when I tried to select my size, the server flipped and out I was. How can you even buy clothes when you can't select a size? Maybe it was just a big publicity stunt. I mean 1000 pieces? 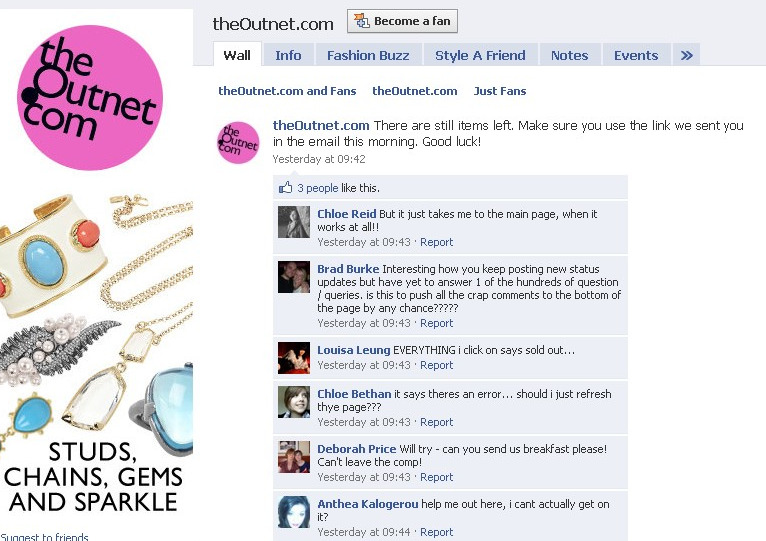 I don't even want to think how many people registered…I also think Outnet handled it very badly! I logged on to the OutNet sale and it was just crazy how everything got snatched up. To be honest I think it was a whole other beast the the AA sale riot. Everyone loves a deal but that mess?! I didnt get lucky on the OutNet sale but I didnt get trampled either. It was indeed a poorly run lottery esp. w/the UK sale. They should have really apologized for their servers and reiterated limited quantities earlier on. Or they could have offered discounts or something to people who RSVPd and couldn't get in. It's also messed up that some people bought multiple items some how so there were things that could have been changed on multiple sides.Everything I tried to buy was sold out (after getting through check out) but I miraculously got a $4900 Valentino silk and crystal jacket in a large size. It worked out ok for me but was a rough process. Of course I signed up but when I clicked on the link everything was sold out. I figured it was too good to be true, but even if people did get items, good for them. Still handled very badly in my opinion. And that American Apparel riot is INSANE! So sad…. I was very disappointed as well!